Note: This is the second in a three-part series on Director of International Field Operations Ryan Iafigliola’s visit earlier this month to Fuller Center operations in Sri Lanka, India and Nepal. 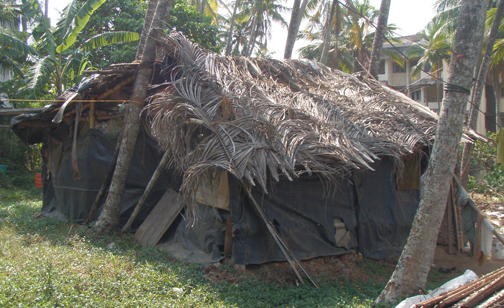 There are two ways of looking at Kerala, India, the southeastern coastal state where the Trivandrum Fuller Center works to eliminate poverty housing. On one hand, it’s paradise with swaying palm trees, beautiful beaches and the usual stunning Indian architecture. It has been named one of the “Ten paradises of the world” by National Geographic Traveler and is especially noted for its thriving ecotourism industry. On the other, it has more than its fair share of shacks much like other parts of India, where 170 million people live in slum conditions, 17 percent of the entire world’s slum-dwellers. Actually, there’s really not two ways of looking at it because it’s hard to look around Kerala or the capital city of Trivandrum without seeing both at the same time. It’s where poverty and paradise collide. Another familiar image of India is of its Hindu people and the artistic gods and symbols of Hinduism. But the Trivandrum Fuller Center is run by a Christian board in an area with many Christians. While in India, Iafigliola saw a familiar face, that of Jim McCracken. McCracken just learned about The Fuller Center for Housing last year when he was looking for an adventure and found one in the Fuller Center Bicycle Adventure. He rode a segment of the Adventure from Kellogg, Idaho, to West Yellowstone, Mont., and had an opportunity to learn from Iafigliola about The Fuller Center and its work in India. McCracken was so impressed with the ministry that it led him to set up a new U.S. covenant partner, the Lewis-Clark Valley Fuller Center in Lewiston, Idaho. But McCracken also was already involved in mission work in India. In fact, McCracken was visiting his pastor friend at a church in the northern part of Kerala at the same time Iafigliola was in India. The two Bicycle Adventurers reunited in Trivandrum. “His church has been working with a church in the northern part of the state, while we’re working in Trivandrum in the southern part of the state, which is roughly the size of Georgia,” Iafigliola said. “So it’s about a 10-hour train ride, but it’s in the same state so it’s relatively close. They’ve been doing things with this church for years. 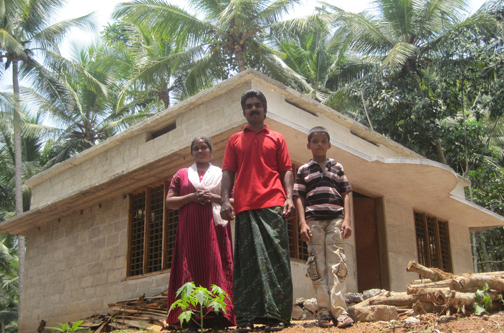 Not only is a new international covenant partner expected to be formed in India, but the Kerala state is now a new destination for our fast-growing Global Builders program that allows volunteers to see fascinating corners of the world while helping people achieve the dream of owning an affordable, decent home. The first Global Builders trip to India is already set for July 15-30 and already is full. It’ll be comprised of a team from Mercer University in Macon, Ga.
And Iafigliola believes the Mercer team will be the first of many who make the trip to India. View many more photos from our April 2012 visit to Kerala, India. Learn more about our work in India and how you can help. Click here to donate and help us eliminate poverty in paradise, in India and elsewhere.